This was one of the hardest movies to watch for me for very personal reasons. All those who have read the About page on this blog, know why. For everyone else here´s a quick explanation. My father fought in this war for almost three years after having been drafted barely aged 18. His stories were as much part of my childhood as were his brooding silences and constant nightmares. I may say that this war is as much part of my life as it is of his. More so due to the nature of it. This is no war to be proud of – most are not but this one especially not. France didn´t even call this a war, they said it was an attempt to reestablish order. But there was a good reason to not call this a war since Algeria was an integrate part of France, although not with the same rights. 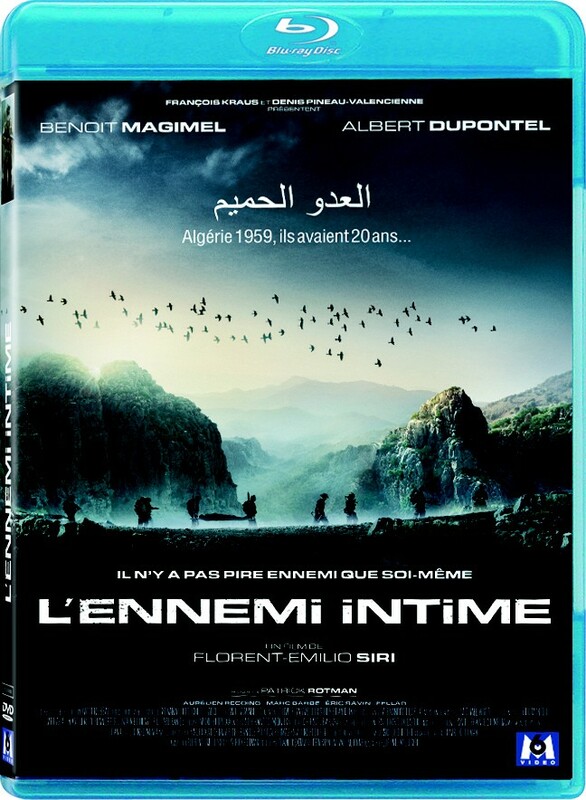 There was no real enemy to be fought since the Algerians were French, hence this movie´s title Intimate enemies, meaning the enemy within. This created an extremely complex situation as this movie attempts to illustrate. After the war had been won from a military point of view it was lost from a political point of view. De Gaulle decided to let Algeria go. What a waste of lives. In future years it was silenced. One was not to speak about it which weighed heavily on the returning soldiers. No one to turn to, no one to listen. As a psychiatrist once told me, it was the general tragedy for men returning from a war before Vietnam, that they had no one to turn to. Not even psychologists or psychiatrists. Post-traumatic stress was just not cured at the time. Ok, this is not totally correct, it was treated but only insofar as the soldier was meant to go back to fight (one of the major themes of Behind the Lines aka Regeneration) but those for whom the fighting was over were meant to knuckle down and shut it. Considering that an apparently (haven´t seen it yet) very outspoken movie like The Battle of Algiers aka La Battaglia di Algeri (1966) was banned in France until 1971 we can imagine what it was like for soldiers having participated in a war that a) was no war b) wasn´t to be spoken about and c) didn´t officially happen… And absolutely no one to thank them when they came home. The whole complexity of the situation is shown in Intimate enemies. Algerians who had already fought during WWII sided with the FLN, the Liberation movement to fight France. Others fought on the side of the French. During the war many changed sides both ways. (The highly acclaimed Days of Glory tells the story of four Algerians who fought during WWII). One very horrible trait of this war was the intelligence´s use of torture. Funny enough, many of those soldiers who tortured were by far the most traumatized upon returning to France. Since my father was just a simple private he did not have to do it but apparently his brother, some years older and a lieutenant was part of the intelligence unit. I never liked the guy so I never bothered talking to him. Just heard he´s been under medication since the late 80ies on account of serious problems with his conscience. Does this serve him right? There is an interesting scene in the movie where lieutenant Terrien talks to the intelligence Sgt. and is being told that he will come around and understand these methods. However not only the French used torture, the Algerians did as well. And terrorism. And cruelty. I remember my father telling me of a march through the desert when they started to see something in the distance and thought it was a Fata Morgana that looked like dancing crosses. Upon their coming closer to that place they discovered that it was a whole convent of nuns having been tortured, killed and nailed on wooden crosses. There would be other things I could add here but this is not the place to do so. All in all: a war with a very ugly face. Now back to the movie. It is well done and absolutely worth watching. It will definitely broaden the horizon of any war movie aficionado used to mainly watch movies of WWI, WWII and Vietnam. On a scale from 1 to 5 I would easily give it a 4.5. One of its most outstanding achievements is to show neither side as being worse than the other. And it wants to make us understand that often diplomacy could save us from going to war. All the Algerians wanted was the same rights as the French. And their independence of course. Is that too much to ask for? The war ended in 1962 but only in 1999 the French government officially admitted that it had taken place. 2 000 000 mostly young French soldiers had to participate in this war. I´m sorry for all of them and for their Algerian counter parts. I had the opportunity to see what it does to soldiers. My father returned to France in 1959. To this day his nightmares haven´t stopped. This entry was posted in Algeria, Guerilla warfare, Infantry Combat, Reviews and tagged Algeria, France, Guerilla warfare, Infantry Combat, Intimate enemies, L´ennemi intime, Movies, Reviews, Terrorism, War Movies. Hey Caroline: The Battle of Algiers is fantastic. Must have been very hard to watch this…. Thanks for the kind words. I don’t usually take conversations offline. But thanks again. It’s kind of you to offer.